Now I have three completed compasses; two mustard and teal (which turned out too large) and my final compass with red print instead of teal. 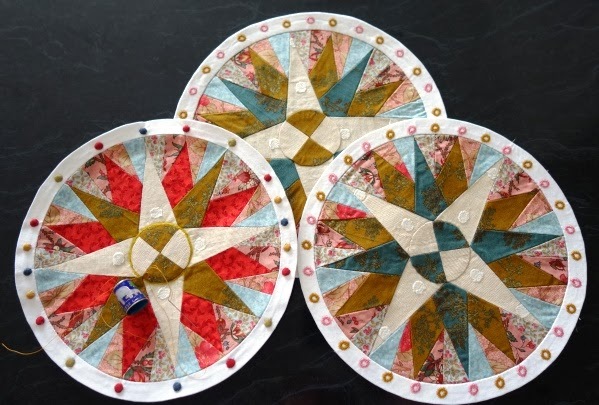 In this photo my needle turned points on the final compass are not completed, but in fact I finished this compass and set it aside several days ago. 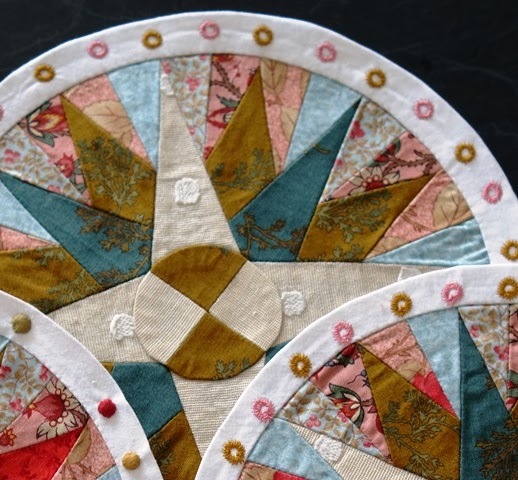 Now I have been considering my applique fabrics for the square and, with fresh eyes, I think I love the teal compass most of all. I don't know what I was thinking changing the colour all of a sudden for my third and now I'm going back to my first idea! 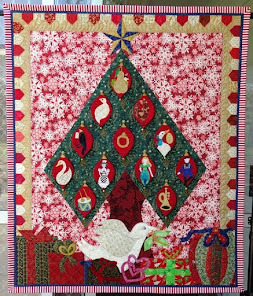 This must be the fussiest quilt I have made, and I haven't moved past Part 1 yet! I've opted to needle turn the compass ring points. It's a lot of work, but well worth it. 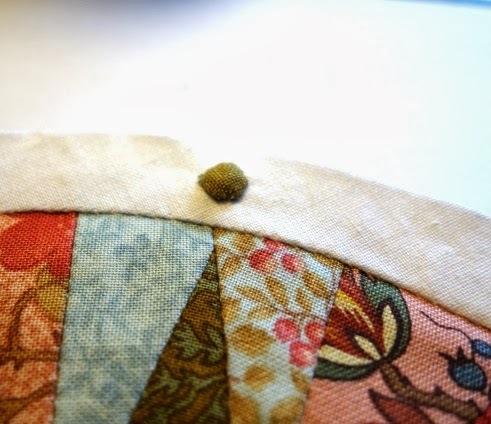 I'm using polka dot fabric as my cheat - it means that I always know the circle is correct and is an easy guide, especially with so many to make. It also saves me trying to shape the circles 'blind' and is easy on my eyes as this is time consuming and fiddly work otherwise. 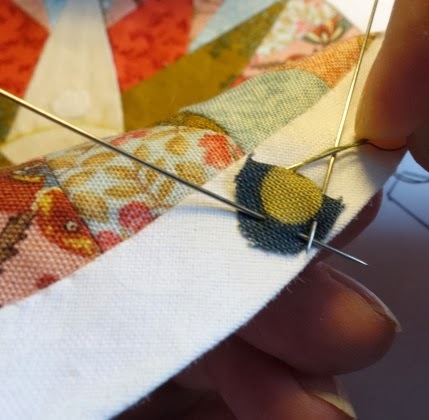 I pin the fabric into position and with small, neat stitches and a thin hand sewing needle, I turn the circle as I work around the shape. As you can see, this is not a difficult process. Yes, it's fiddly and time consuming but definitely satisfying too. 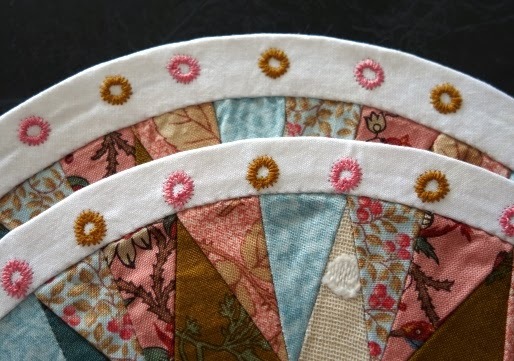 I've been working on these points in the early afternoon when I get the best light in my sewing studio. It can't be rushed and I'm patiently working towards getting them all done in their own time. 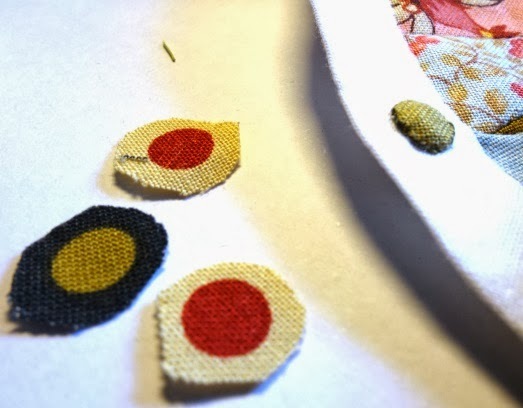 I've started the applique now and return to these points when I'm in the right mood to complete them. Actually what I've been thinking as I turn these points, is that I think I prefer my original colour scheme of the mustardy gold and teal for the compass. 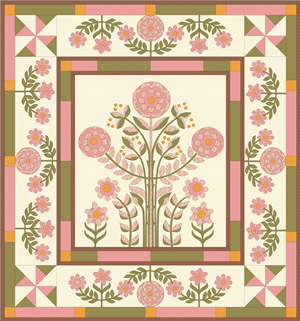 I had made two of these in this colour scheme but they were both too large and put away for cushions. Having put them aside for a short amount of time, looking at them afresh, I love them all over again. I think I like them more than my current option with the red print instead of the teal! 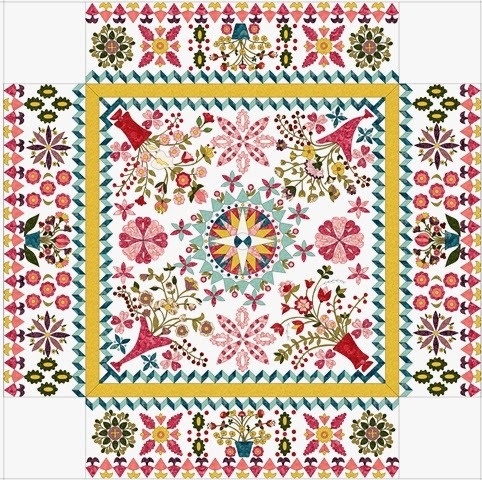 I'm going to put this red version aside and look afresh at it alongside my fabric choices for the rest of the square before decided what, if anything, I'm going to do about my colour indecision. 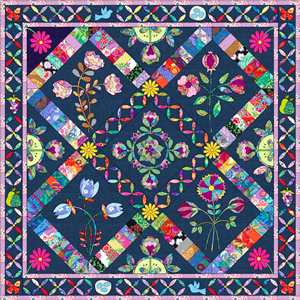 I feel so undecided about the colour choices in this quilt, I can't seem to settle and be sure. It's so frustrating. How do you solve colour issues? 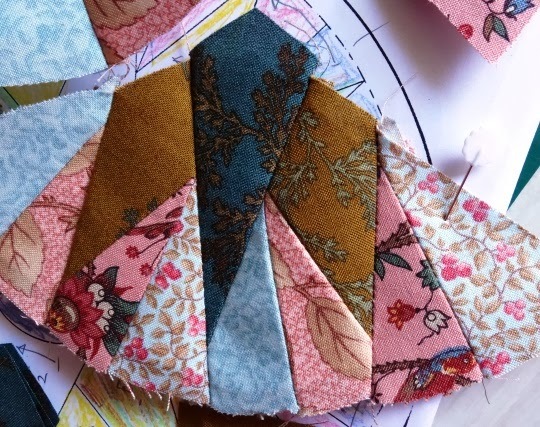 Do you know what colours you'll use for a quilt or project straight away? Or do you work at it? Once selected do you stick with it...or do you, like me, keep switching and swapping?! 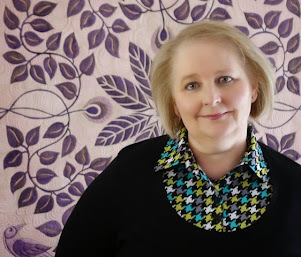 If you'd like to read more about it, you can do so by visiting the Love Entwined Page at the top of this blog, underneath the header. 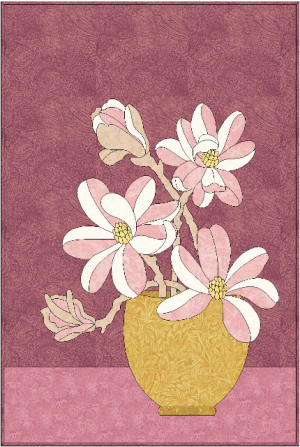 If you're making the quilt yourself or are enjoying the journey, please leave a comment. 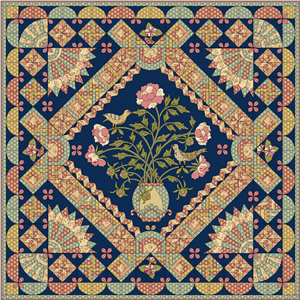 If you are making the quilt and would like to share your progress and ideas with other quilters who are also taking part: you can do so by adding a link to specific blog posts. See the Love Entwined Page for more info. There are so many possibilities for the the compass ring points. 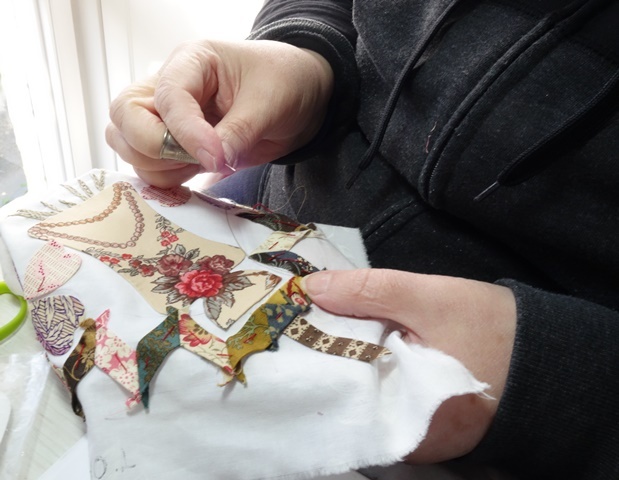 I've seen embroidery, tiny buttons, sequins, seed pearls, french knots and rose bullion used. They're all lovely choices. 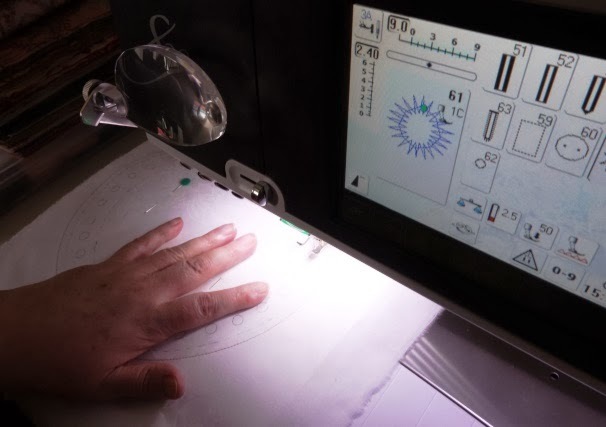 My first idea for the points around the compass ring was to embroider them on my sewing machine. 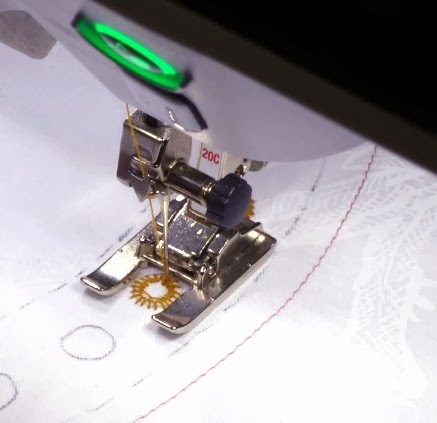 My Bernina 820 has a really lovely little stitch which I tried, in a gold and pink thread to match my compass. 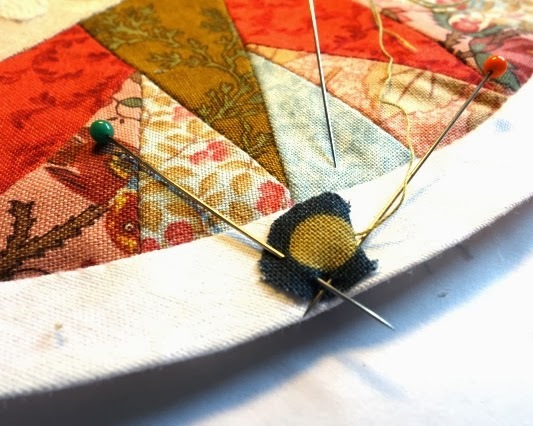 You can see this stitch here on my two extra compasses (which I will make into cushions because they turned out too large to use in the quilt). I'm not delighted with the outcome. The points are floating out of line. No matter what I tried, I couldn't line them up in the circle. I made three rings, but none were good enough for the quilt centre. Each stitch set seems to jump a little and you can see that some are on point, some are off point. Up close, its not as distracting, but viewed as a whole, its just not precise enough. The compass itself requires a lot of attention to detail and precision. 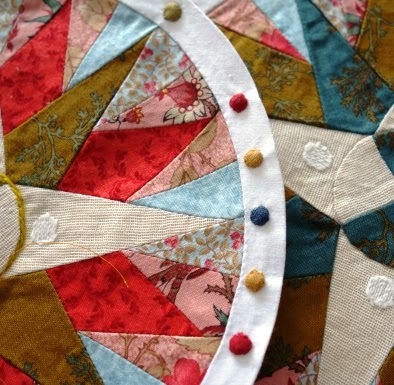 Now that my compass is just how I want it, it feels like a shame to let it down with off point embroidered details. I'm a bit disappointed that this didn't work for me as I was hoping to utilize some beautiful stitches throughout the blocks as flourishes and details.I finally decided to opt for tradition and will be needle turning these tiny points which you can see I've started in the image above on the left compass. 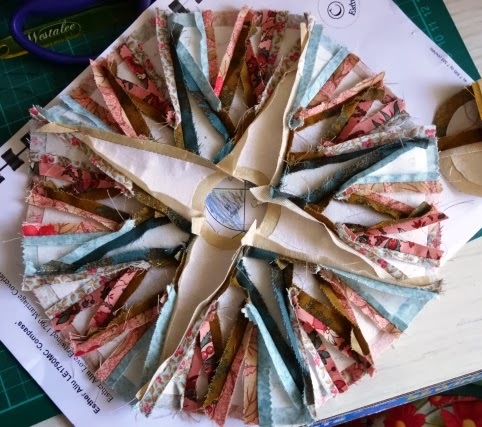 This morning I'm hand sewing my remaining compass points. I've only stitched down four so far, it's time consuming and hard on my eyesight! 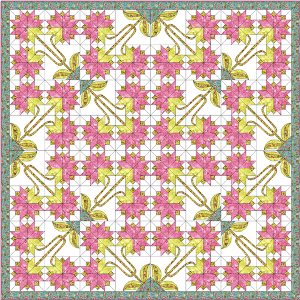 It's also a fiddly technique and contains too many images to share during a WOW Linky Post so I'll upload it after the 48hr WOW period. I'm hoping to finish today as I have a busy week ahead and want my compass and ring to be finally completed. 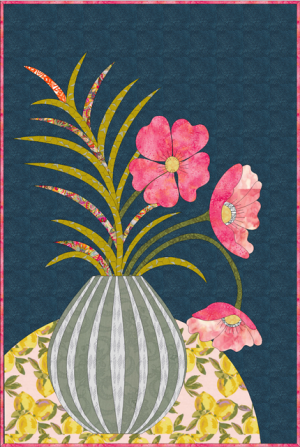 I'm eager to start on my flowers and vases and you'll see exactly why when I share images of the fabrics I have in mind - they're so charming. I'm hoping that with the cooler weather that's finally arrived, I'll have more energy to work on LE and manage some real progress. 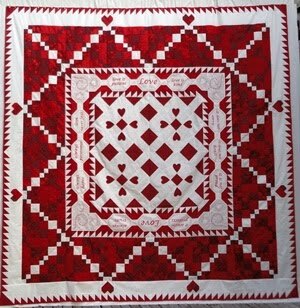 I've had several perfect days to quilt all day lately but found I couldn't as it was just too hot and humid. 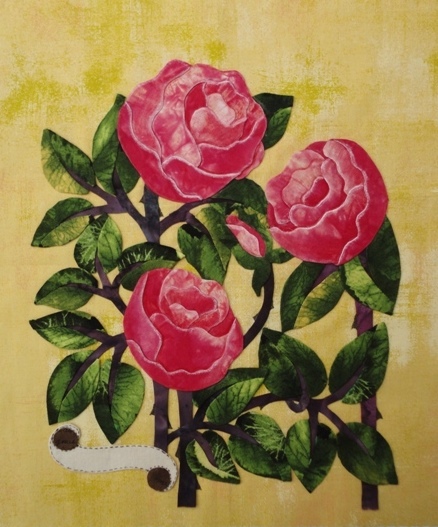 Speaking of the weather, this is a picture of a surprise rose. We've had a heatwave this last month and my garden is completely burnt. My DH was around the side of our house when he found a wild (?!) rose bush behind the garage - one I've never seen before. 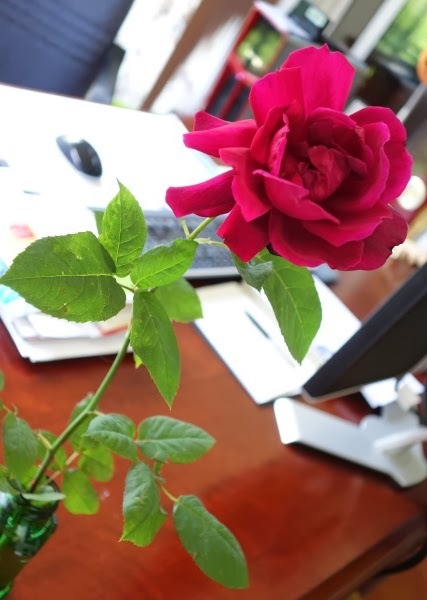 The roses were all dead and burnt except for this beauty, isn't it stunning? It smells wonderful too. I don't think it's a David Austin but I do wonder how full it might be if the weather was kinder. I'm thinking of transplanting it when the weather cools, it's just too beautiful to keep secret. I think the compass is so important; it immediately centres and draws your eye in on what is otherwise, a very busy centre square. 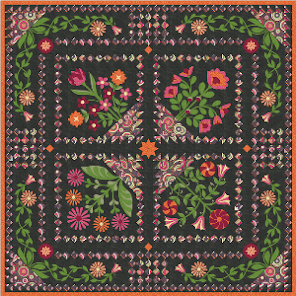 For this reason I want my compass to work with every other fabric that will be used in the centre square and throughout the borders. 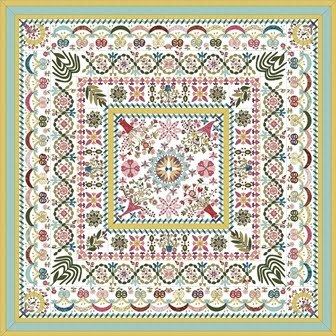 I'm now feeling that my LE will be an antique toned patchwork scrappy style quilt. I have had many colour ideas about LE, but ultimately, my feelings about the colours are going to be my guide. I just can't help being drawn to certain combinations. 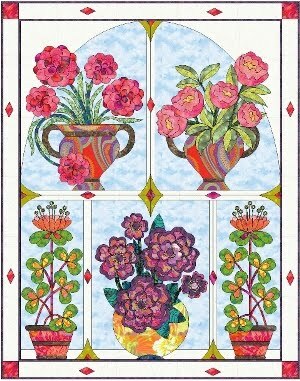 These fabrics work for me because they have just enough colour and tone to work with all the applique to come. 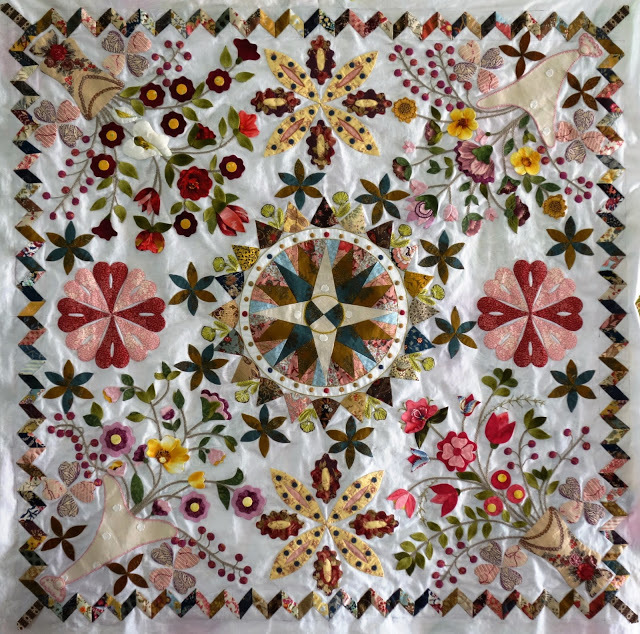 I love the mustardy gold and teal combination and the pinks balance out the need for blue pinks and reds that will appear throughout the quilt too. 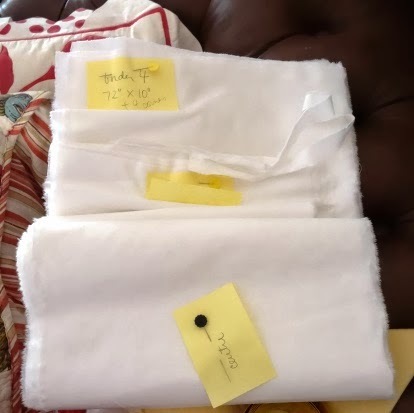 I swapped these fabrics over many times before settling on these. 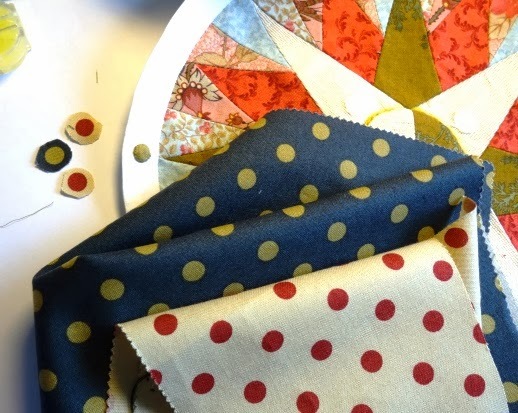 The only must have was the polka dot below - it just speaks to me and had to hold the centre colours together. 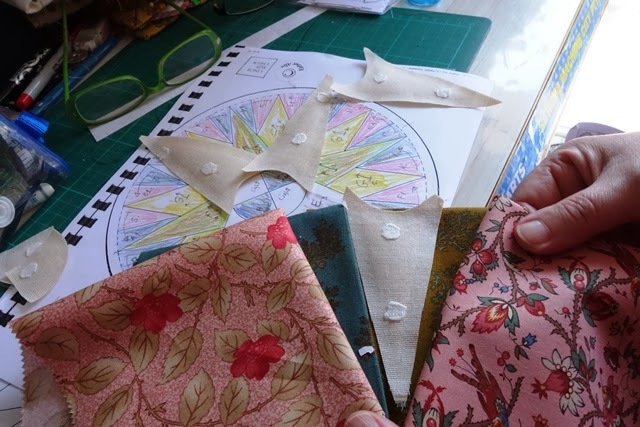 I thought I had so much fabric to make my compass, I had no idea I'd be making it again and again before being satisfied! Luckily there was just enough of the blues and pinks as I really liked the balance of them together. 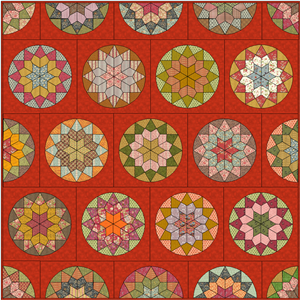 As in the pattern, I followed the guidelines and created segments. I think this is the best way to create the compass. Saying that, it is not without difficulties. I have my own little habits that I'm not even entirely aware I'm doing - like always adding just a smidgen more when cutting out. That tiny bit extra that usually serves me so well, actually meant that my first compass was 1/2 inch too large. 1/2 inch may not sound too bad, but placed on the mapped out centre square, it is visually too big. And there's no way I can trim it down to size because of the beautiful points. 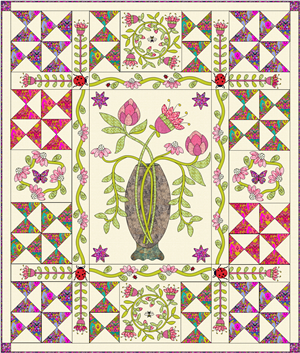 And given the spreading flowers and crown to come, I can't afford to start growing any of the centre elements. It was just too big. On my second attempt, my compass was 1/4 inch too big! 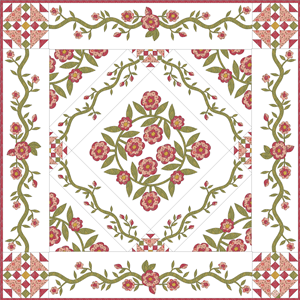 I went back to my plain fabric pattern sample which I had created during the pattern drafting process. 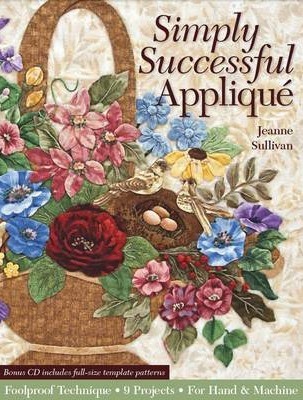 Of course it was perfect and I was stumped as to why I was now struggling...and running low on fabrics! 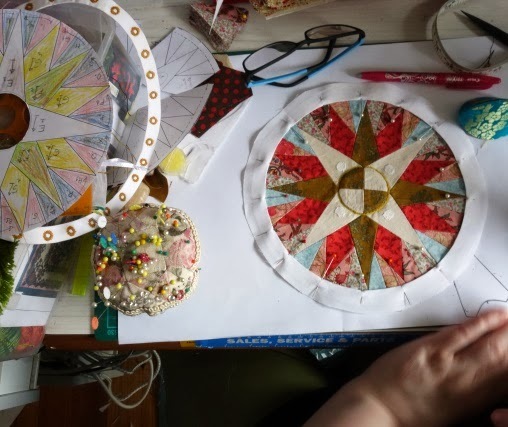 I had no choice but to make yet another compass and keep making them until I had one that was just so. The compass is so important. 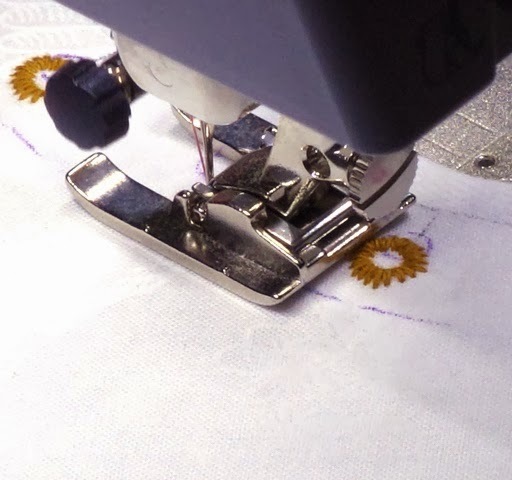 Apart from the importance of the fabrics you use, if there is any error in your compass it will be noticeable, it will stand out because it is the centre of a busy square design and the eye is just drawn to look at and scrutinize it. And if you are anything like me, any obvious imperfection will keep nagging at you. Now, I will say here that I don't believe in 'perfection'; what I do believe in, is doing the best you can with the skills you have. 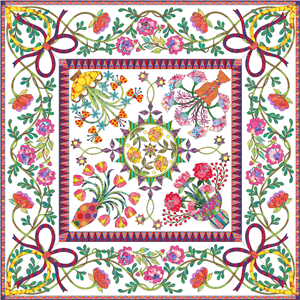 I also think that there is a real charm in the variation which always occurs with handwork. Love Entwined is full of this kind of charm and gentle variation which I personally see as a kind of signature of the maker. I'm happy for those variations. And knowing that this is an heirloom and will be around for what I hope will be a long time, I just can't ignore a too big compass being squeezed in. So I started on the 3rd compass. This time I added a red print instead of the teal that I love. 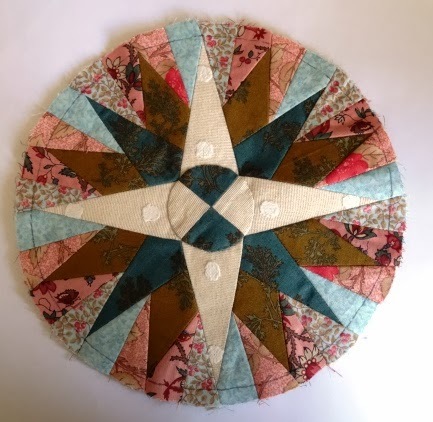 I do have just enough of the teal but as I now have 2x in this colour scheme which I will be using, I want the quilt compass to be slightly different. The over sized compasses took a lot of effort and are beautifully made- they won't be going to waste. So what will I be doing with these 2x extra matching compasses? Cushions! I know many of you made several compasses before getting the size right, what will you be doing with your extra compass? 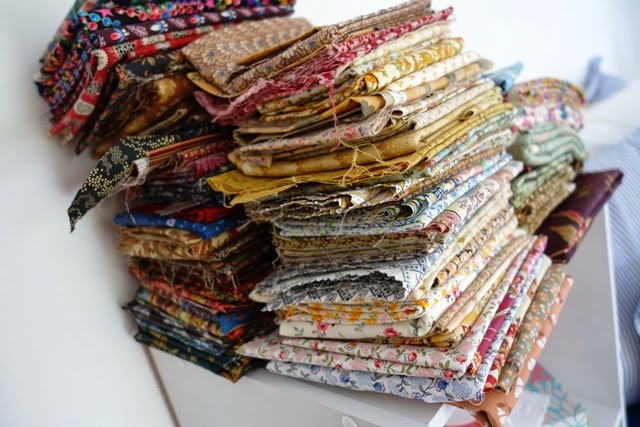 So many fabrics, so hard to choose between them all! 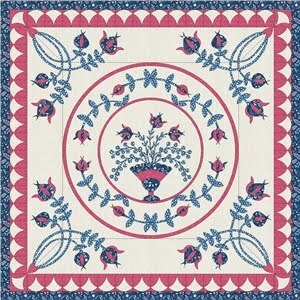 Since creating Love Entwined, I've been thinking and re-thing my fabric options almost nonstop! It's been difficult. Over in the Group there's actually so many styles and schemes being made that I've been able to satisfy a lot of my curiosity - what would a dark background look like? what about brights? what would 1930s prints look like? What about moody mid tones? I've seen so many styles and yes, they all work! 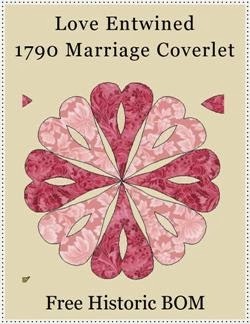 I'm making my Love Entwined on a white background -I decided on white because I'm being drawn to many antique tone fabric prints and I think the white will work so well alongside them. 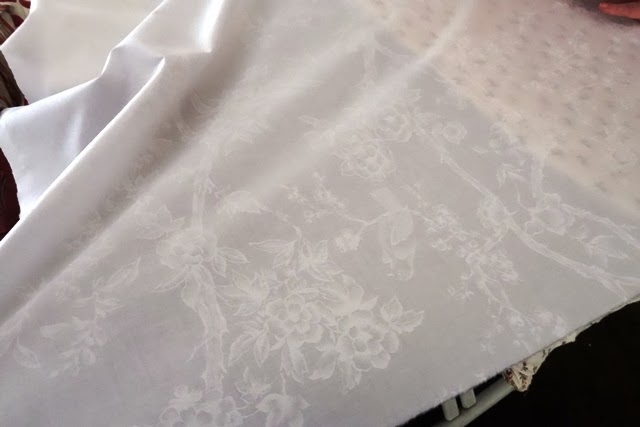 It has light detail in the print, its not really a french toile but I do love this affect as it adds depth without distracting from all the applique that's coming. 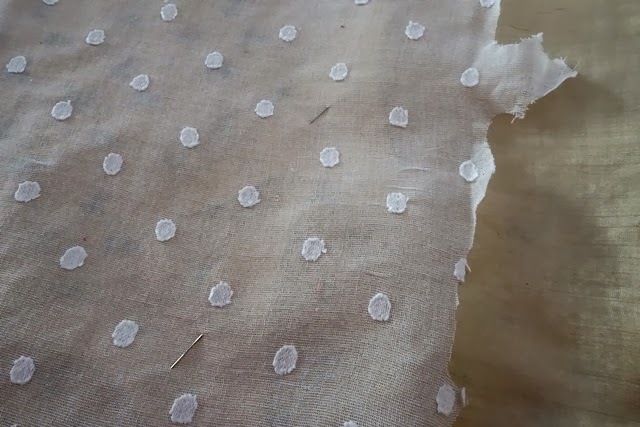 I'm starching my fabrics and making sure that the grain is straight: I do this to prevent buckling or pulling on the fabric once all the applique is applied. 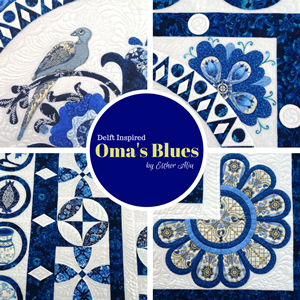 It's a small detail which makes a big difference to the overall finish of the quilt top. Preparing all the pre-cut borders. As I'm starting in the 9th month, I'm making the quilt in different order from the monthly BOM parts. 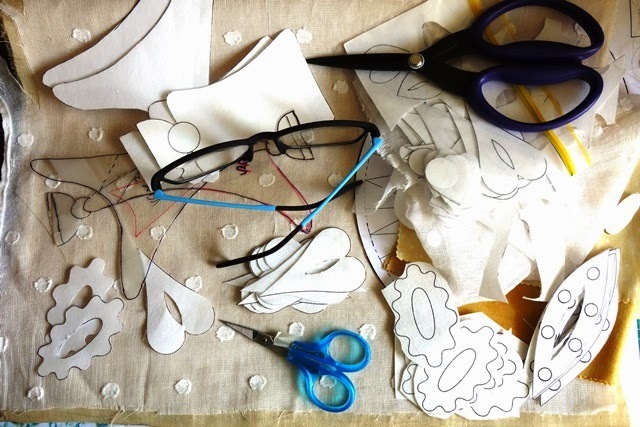 I'm creating production lines and today I'm working on getting all my fabrics ready. 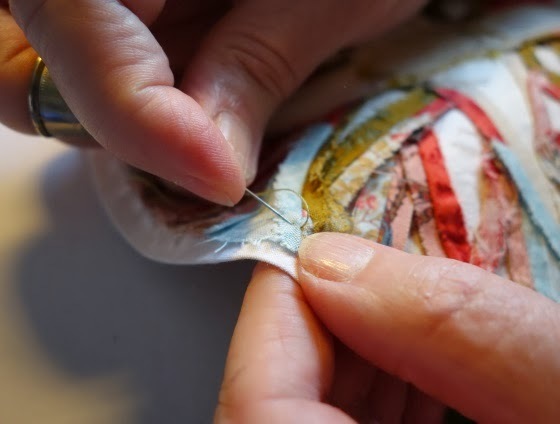 No matter how long prepping takes, its always faster and more efficient than creating applique that warps on the background or bleeds during steaming after being sewn down. Fabric preparation is an insurance against this kind of preventable disappointment later on. We're past the half way point on the BOM this month, but for me it still feels like such a new quilt! What do you think? Time flies when you're having fun? 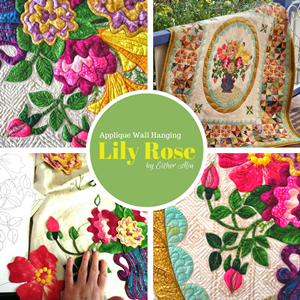 or have you been too busy applique-ing to notice?! It's another busy month! 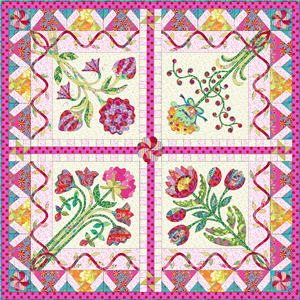 Part 9 sees the 2nd flower basket borders (the left and right side) take shape in border 2. 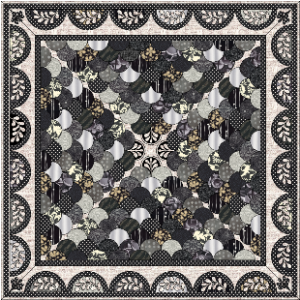 There's still some committed work ahead, but the quilt is starting to look like the beautiful coverlet we all know it's going to be in about 8 months time. As you know, I've only just made a start on this quilt myself. This is a quilt that wants to take its time, so if you are working at your own pace - or like me, only just making a start, we're all in this together. You don't have to keep up with the release dates, just keep in touch. 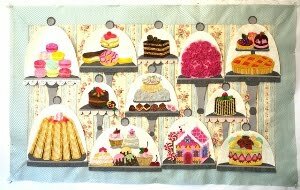 I've been amazed at the wonderful and varied LE's being made and shared over in the Yahoo BOM Group and if you haven't shared your own journey, please feel free to do so! 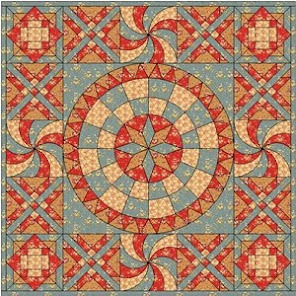 Also, if you are creating and blogging at the same time, why not share your ideas / tutorials and techniques with quilters now or in the years and months to come? 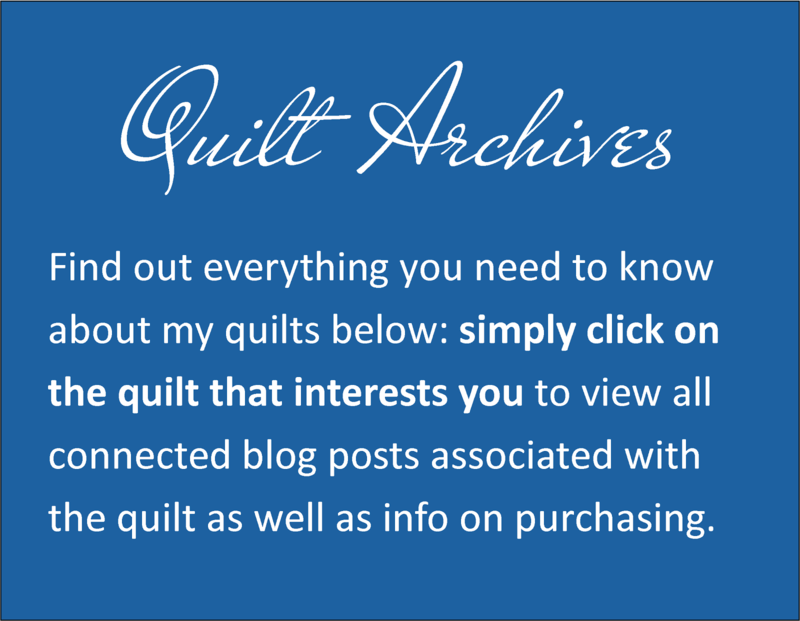 By adding a link in the archive at the top of this blog on the Love Entwined page, you can link to any specific LE posts that might be helpful to future quilters. 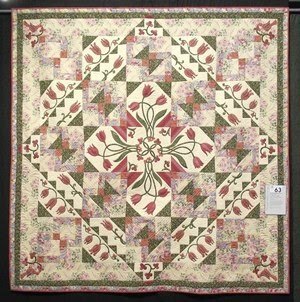 It's so heartwarming to see how many quilters are sharing their knowledge through the archive and through the Yahoo BOM Group. Talk about a friendship group! 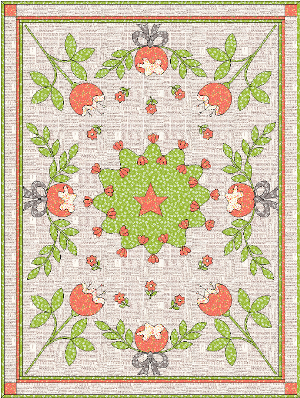 And, just so you know - this pattern is still available for free. Yes, all 9 parts. 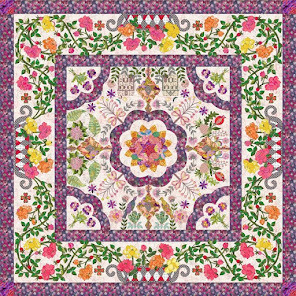 This is unusual for one of my BOMs; but as we all know, and as I've said before, this is no ordinary BOM - it's a historic revival and the most important thing as far as I'm concerned, is allowing any quilter who wants to, the chance to make it themselves, for free. 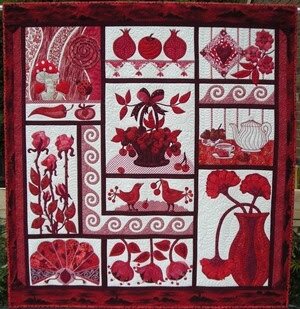 Each ‘block’ of the month is released monthly, on the 15thof each month. All ‘blocks’ are available for free during the month of their release. Any missed ‘blocks’ may be purchased. 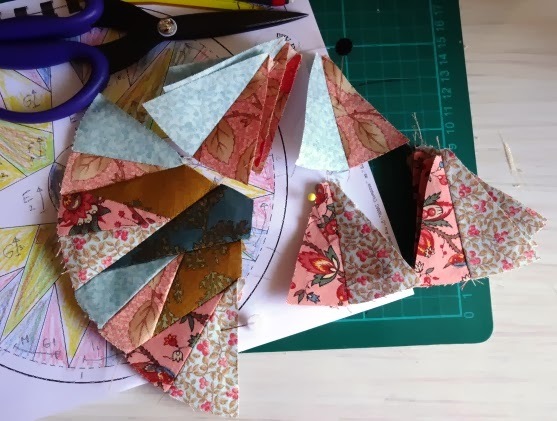 Of course, the journey started last year when I created the pattern and launching the BOM was a exciting time, but I just didn't feel ready to make a start on it. There was always something amiss. 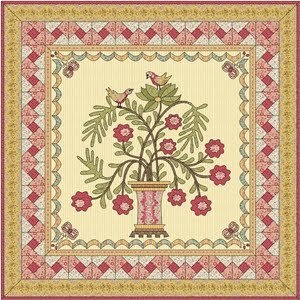 The timing was hectic for me, then I was torn between endless colour scheme possibilities and finally I suffered real disappointment with my Bernina 820. I lost a lot of enthusiasm for sewing during that time. 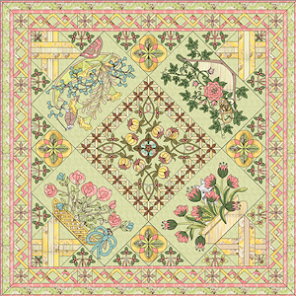 But most of all, I was really hoping that we might uncover something more of the mysterious quilter who poured so much love and detail into the original quilt in 1790. It seemed a far reaching idea...yet possible. After all, finding the quilt was an enormous achievement in itself, so I dared to hope in my heart that we might be able to at least give her a name... but she is still a mystery and she is still out of our reach. It's true, I was waiting. But now I can wait no longer. 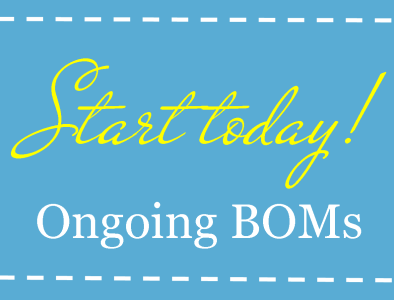 Are you a member of my Yahoo BOM Group? 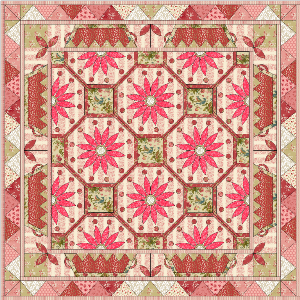 Have you seen the amazing quilts members are making? I am astounded with the quality, ingenuity and difference between the LE's. Honestly, there are so many different styles, seeing them just makes me so happy and proud. 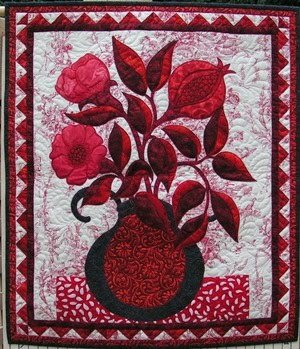 The idea of so many beautiful quilts out there, reflecting each quilter in their own unique way is wonderful. This year I've decided to focus on Love Entwined. This is hard for me as I have over 50 WIPs on the go, but I have to focus because I can't let another year pass without having this quilt made! It's too much of a Must Do! 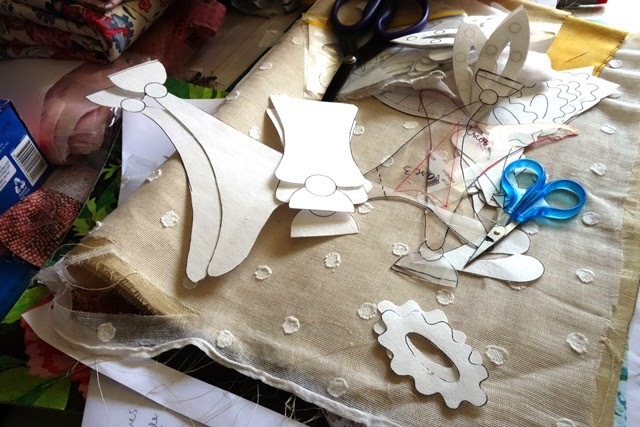 It's such a precious heirloom, even at these early stages it feels special to be sitting down and devoting the time needed to create it. 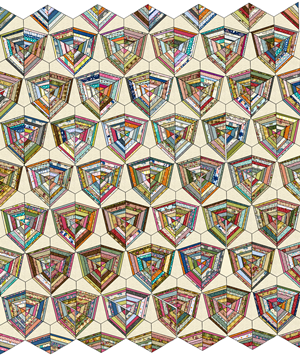 It's not a quilt you can rush. 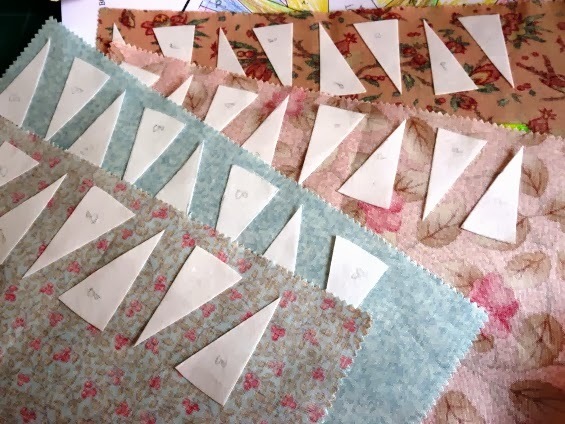 Today I can look over my sewing room in the morning light and say, this is it, the beginning of a very special journey.Yesterday I printed out the center square pattern in order to start a production line, I'll keep you posted as I work my way through, I aim to get the compass finished today. 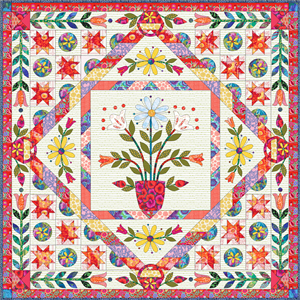 Is there a special quilt project you're waiting for the right time to make a start on? I've finally settled on Sunshine & Shadow for my kitchen wall. You'll know from last week that it was actually my first choice, but I played around with different quilts before going back to my first idea! 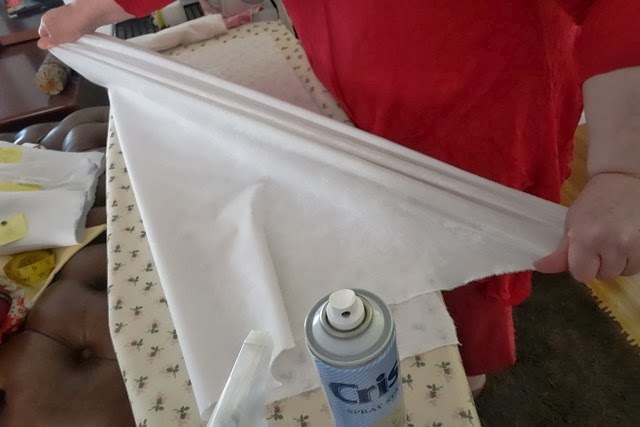 I often do this with fabrics too, if I could only be satisfied with my first impressions I'd save myself a lot of time. 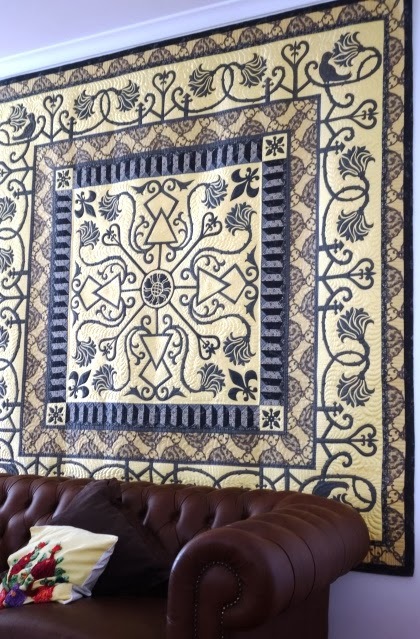 Yellow can be a difficult colour to photograph, I knew that when I created Sunshine & Shadow, but what I didn't expect was how different this wall looks at different times of day when the yellow in the quilt looks as light as butter and sometimes as dark as daffodil. 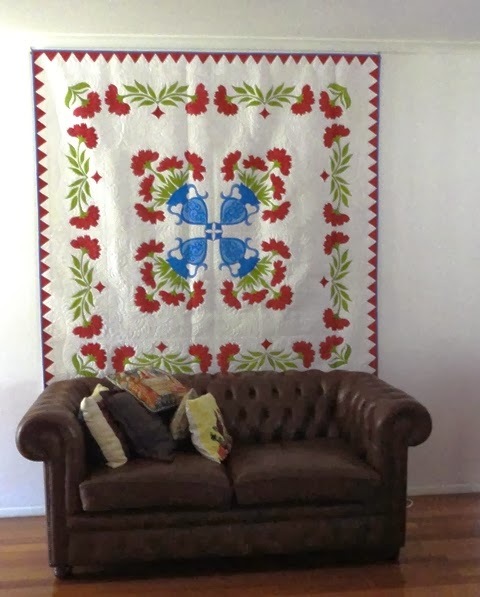 It's definitely a moody quilt that changes the light of the room all day long. 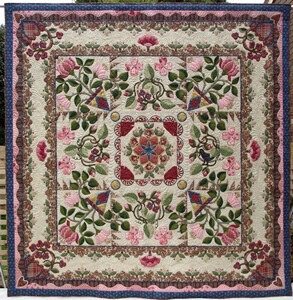 Actually I would have left Peony Pride (left) up for another season as I do love it so much, but it's background is pristine white and lately I've noticed dust settling in the quilting grooves, so I've taken it down to give it a clean. 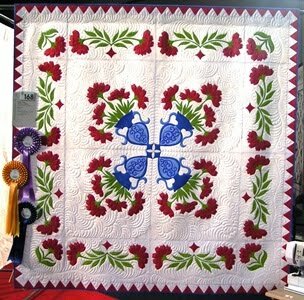 It's too hot at the moment to wash this quilt, but as soon as the weather cools from steaming hot to mildly warm, I will wash and dry it outside. I never hang my quilts from the washing line, I dry them flat so I need good weather - but not too hot - to dry them perfectly. 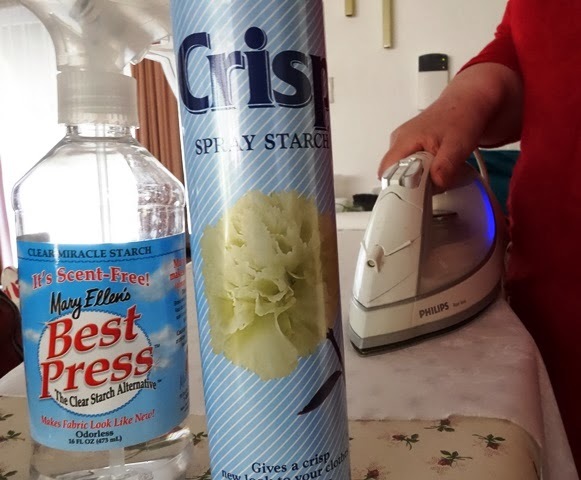 I like to wash all my quilts at once just a few times a year and I wash most of them flat, by hand, so it's a time consuming workout!